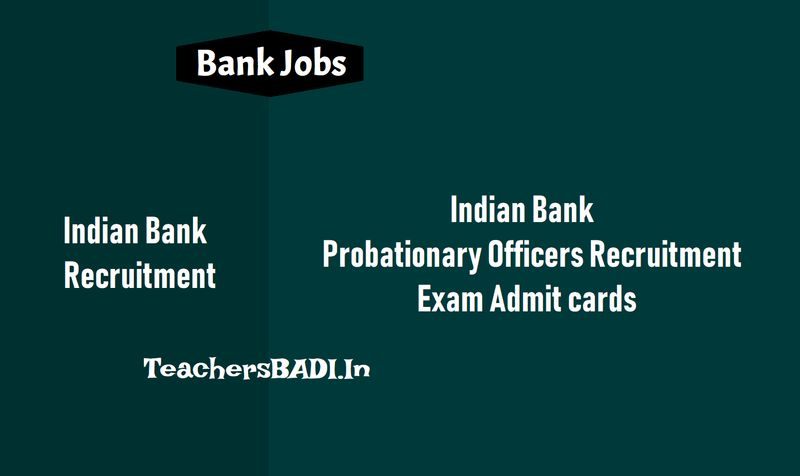 Indian Bank POs recruitment, Call letters, Admit cards, Indian Bank POs admit cards, Indian Bank POs prelims, PO recruitment, Probationary officers, Indian Bank Recruitment 2018, Apply Online for Probationary Officer Posts: Indian Bank has issued notification for the recruitment of Probationary Officer vacancies for Admission to Post Graduate Diploma in Banking & Finance Course Offered through Manipal Global Education Services 2018. Eligible candidates were applied online as per its schedule. The admit card for the preliminary examination to recruit probationary officers (PO) in Indian Bank was released on Wednesday on the official website of the bank. The online preliminary examination will be held on October 6. The direct link to download Indian Bank PO admit card 2018. The admit card will be available for download until October 6. The application process for filling 417 probationary officer (PO) vacancies through admission to Post Graduate Diploma in Banking and Finance (PGDBF) course at Indian Bank Manipal School of Banking (IBMSB) began on August 1. The number of vacancies is provisional and may vary according to the actual requirement of the bank. Candidates will be selected through a process consisting of online exam (preliminary and main) followed by an interview. Successful candidates will go through a nine month course (campus programme) at Manipal Global Education Services, Bangalore followed by a three months internship at any of the Indian Bank Branches. On successful completion of the course, candidates will be appointed as probationary officer in any branch of the Indian Bank. *Qualification: Candidates should possess Degree (Graduation) with a minimum of 60% marks (55% for SC/ ST/ PWD) marks in aggregate in any discipline from a recognized University or any equivalent qualification as such recognized by Central Government. *Selection Process: Candidates will be selected based on Online Exam (Preliminary & Main Examination) followed by Personal Interview. Indian Bank PO Prelims admit card: The preliminary examination for filling probationary officer (PO) vacancies in Indian Bank, through admission to Post Graduate Diploma in Banking and Finance (PGDBF) course offered through Manipal Global Education Services 2018, will be held... Candidates who have not downloaded their admit card until now should do it quickly. The admit card was issued on the official website. Note: Candidates are advised to regularly keep in touch with the official website for details and updates. The Indian Bank will release the admit card (call letter) of the online main examination for filling probationary officer (PO) vacancies in the bank on its official website. The admit card will be available for download. 7. Click on login and call letter will be displayed on the screen. The online main examination will be conducted on November 4, 2018. Candidates should check the admit card to know details about date and venue. They must carry the admit card to the examination centre. Candidates who clear the online main examination will be called for an interview. Successful candidates will go through a nine month course (campus programme) at Manipal Global Education Services, Bangalore followed by a three months internship at any of the Indian Bank Branches. On successful completion of the course, candidates will be appointed as probationary officer in any branch of the Indian Bank.